Although Impeka had guaranteed the top spot in the M40 category already on Thursday, but the team from Mazeikiai didn’t take their foot off the gas and taking an impressive 111-46 victory against Energetikas on the final day of the tournament. The champions dominated from the very first minutes, taking a 32-9 lead after the first quarter and firing on all cylinders throughout the rest of the game to finish with a championship record of 111 points. Aivaras Jokubaitis had a magnificent performance, scoring 46 points and grabbing 32 rebounds, while Busma and Erikas Uscinas chipped in with 16 and 14 points respectively. 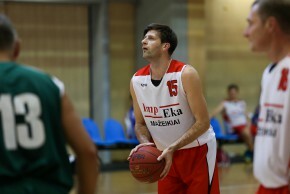 Lenktaitis had 16 points for Energetikas, with Knieta adding 13. Energetikas finished third in the M40 category, with the local Liepaja team Kraukli, who lost 74-58 to Basketclub on the final day of action, squeezing in between the two Lithuanian teams on the podium.